I have been down in Sydney for a few weeks being with my youngest daughter while she waited for the birth of her first child. It wasn’t an arduous task for me (she probably has a different viewpoint!) – because November has always been my favourite month in Sydney. 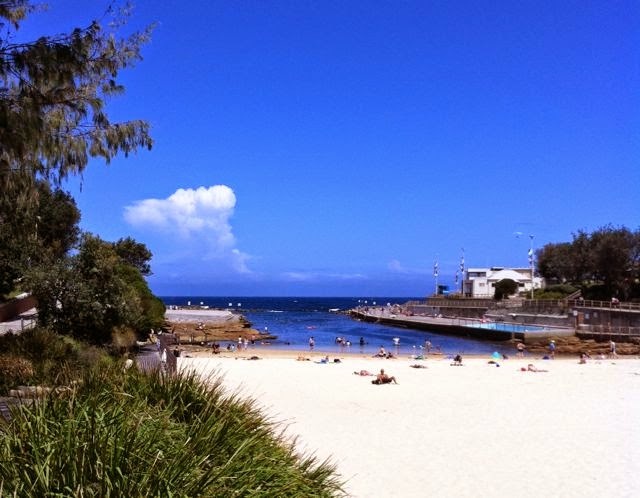 Winter has finally blown away, the ocean sparkles, the scent of star jasmine (Trachelospermum jasminoides) fills the air and the harbour foreshores are given a ‘blue rinse’ with the magnificence of flowering jacaranda trees. Every now and again you catch an accidental/inspired collection of flowering plants that just puts a smile on your face. 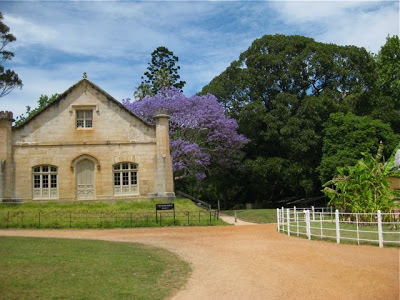 Try a jacaranda next to the scarlet of an Illawarra flame tree, next to the golden yellow of a silky oak, next to the creamy white of a melaleuca with crimson bougainvillea spilling over a sandstone wall? Nature, weaving magic. Debate raged in the daily paper while I was there when one correspondent suggested that all ‘exotic’ plants should be removed from Australian gardens and replaced with ‘natives’ picking on , in particular, the jacaranda tree a-native of Brazil. Well, he almost started World War III. His argument just doesn’t make sense. Gardens everywhere have always been an eclectic mix of plants from all around the world whether they be trees, shrubs or vegetables. My garden, for one, would be empty- no frangipani, gardenias, citrus, papaya, bougainvillea, tomatoes, gingers-the list is endless. Of course in difficult climates and conditions it makes sense to grow whatever plants are best adapted to those conditions – usually ‘natives’. I would agree with him though with regard to street tree plantings. Very often the choice of trees gives no sense of place at all – look around you in most cities and you could be anywhere in the world. This puzzled me until I was employed by Waverley Council in Sydney in the 1980’s and realised that almost up until then they had no horticulturists/arborists working at Councils and street trees choices were made by the Chief Engineer who worked from a list of about 6 trees. Then I went to Barcelona, visiting a landscape architect friend of mine, and looking around you could have been in Sydney with their gum trees, Canary Island date palms and London plane trees. He said they had a list of about 7 trees and only two were different from the Sydney list! It’s a personal thing but for me the beautiful lavender blue of the tropical jacaranda enhances the Sydney streets capes in a way that the London plane tree just doesn’t, contrasting so well against the warm sandstone buildings of Sydney (e.g. along Oxford Street, Paddington outside the Barracks). So we are bequeathed often inappropriate, boring, street trees that have usually been amputated by poorly trained tree loppers because they have to try and grow amongst an ever-expanding tangle of overhead power-lines. What a different place Sydney would look if the then Premier, Bob Carr, had got his way in 2000 and, as a lasting new millennium project, had put all power lines in Sydney under the ground. How wonderful it would be to drive around Sydney with avenues of trees arching above you. Go around the harbour-front at Rose Bay and see the magnificent arbour of’local’ fig trees (power lines under the ground!) and you will get a glimpse of what we could have. 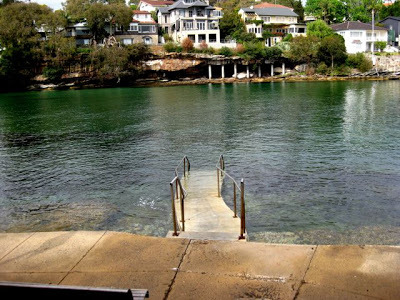 Another bonus to being in Sydney at this time of year is that my favourite swimming spots are still relatively empty – the water still too cold for most folk. I love swimming. Swimming has saved me many times – it seems to have the natural power to cure and always lift my spirits. When I swim in the sea I feel totally free – gravity suspended – and I have never had a swim that didn’t make me feel better. Plus, it is exceedingly good exercise for gardeners! 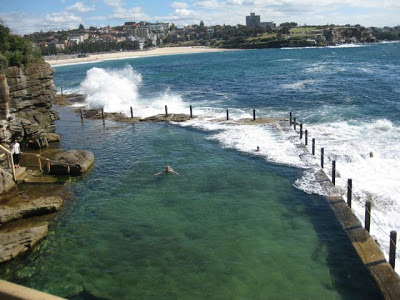 So I just thought I would share some of my favourite swimming spots with you. 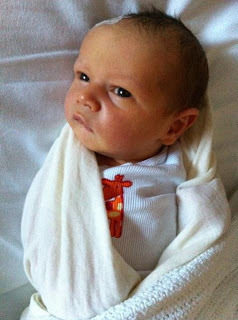 Then finally, after a long wait, our dear little grandson was born on 3 November. After 5 grand-daughters he was a bit of a surprise, but a beautiful one. 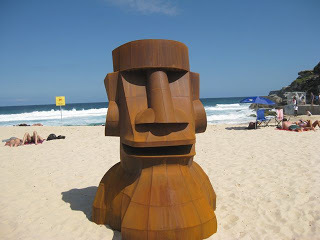 My Favourite Things to do in Sydney. 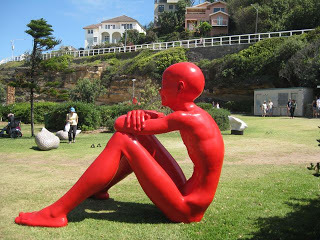 No.1: Bondi to Bronte walk, Sculptures by the Sea (pack a pair of bathers and a small towel). Start with a coffee at Speedos Cafe, North Bondi and say hello to the lovely Anna and her sisters who have being running this place for years. Get a seat by the window and take in the view. When my brother arrived for a visit from the UK after one trip to Speedos he said “just leave me here for two weeks and I will be a happy man”. I have been going in this cafe since it started (about 25 years ago). The building reflects a time when Bondi was a bit shabby (the original owner was ‘colourful Sydney underworld figure’ Abe Saffron) but Bondi has always been colourful itself with steady waves of alternating migrants. When I first came here in the 70’s you heard the accents of middle Europe from Warsaw and Budapest – Holocaust survivors and their children. I remember being chilled to the core seeing, for the first time, a woman in a supermarket with a camp tattoo on her arm. Wander around now and the accents of Durban and Minsk have mostly replaced them. Pumped with caffeine take time to have a look at the mosaic mural around the baby pool at North Bondi before you walk along the promenade south to Bronte. The endearing joy of Bondi Beach, in any weather, is that you totally forget that the city is bustling on behind you and that you are less than 7km from the city centre. ‘Admire’ the graffiti on your way. 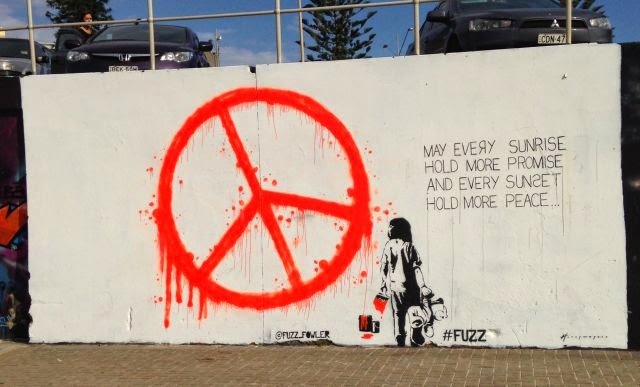 In particular the tribute to the Anzacs and those who died in the Bali bombing where flowers have been left every day since 2005. 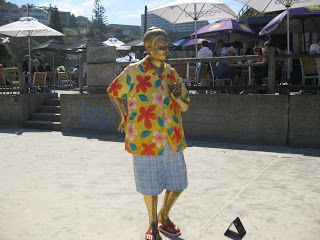 Keep going past Tamarama Beach (‘Tamaglama’) home to the buffed and waxed beautiful young things. Leave plenty of time to look at the sculptures. The juxtaposition of blue sky, aqua Pacific and white sand just adds another dimension to my experience and enjoyment of others creativity. 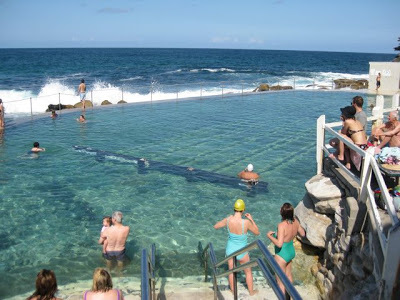 The surf at Tamarama is notoriously treacherous – so make sure you swim between the flags or in one of the ocean pools around the corner at Bronte Beach. This beachside suburb maintains it’s 1920’s feel with landscaped park, model train for the kiddies, Norfolk Island pine trees and picnic sheds. Day in and day out the benches around the ocean pool are lined with the same guys – they have designated this area ‘Dr. Bronte’ and I can see why. They swim, yarn, go for a coffee, check out the racing’form’ for the day, spend hours looking out to sea and doing the crossword in the daily paper Beats staying home and watching the tellie. If you have time – go for a walk in Bronte Park up the gully to the waterfall at the top and rest for a while of the big flat rock. A quiet place in a busy city that has special significance for local Aboriginal women going back thousands of years. At weekends this park is crowded with with large groups of picnicers that looks and sounds like the League of Nations. If you have time keep walking round to the next beach of Clovelly. 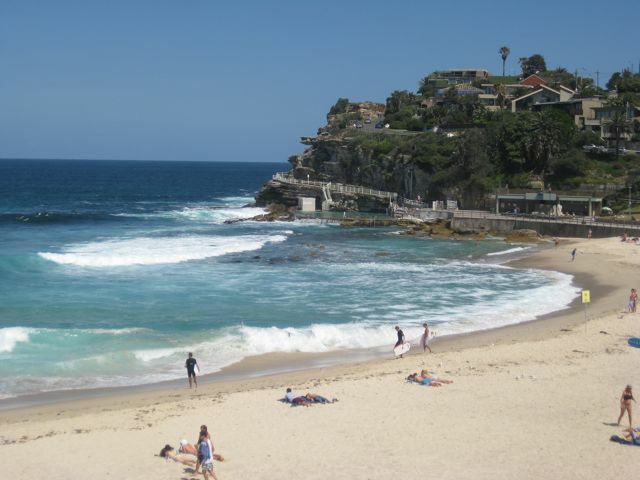 In fact, you can pretty well walk along the coastline from Bondi Beach to Maroubra Beach – about 9km and you would not get any better views along the east coast of Australia or a better feel for seaside Sydney. Hooroo!